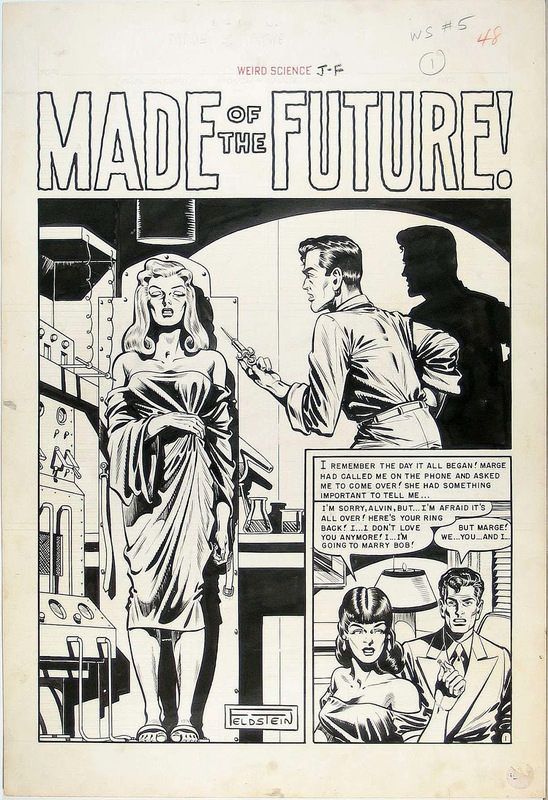 Let's enjoy the original art-boards for "MADE OF THE FUTURE! 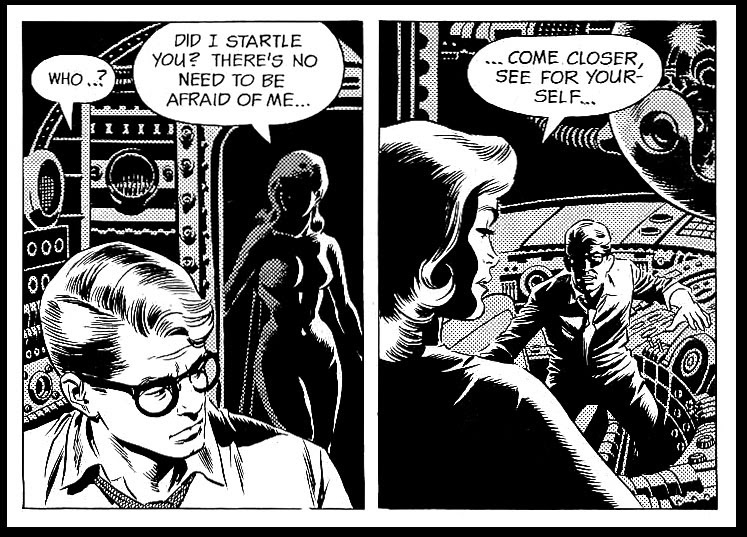 ", written and drawn by Al Feldstein. 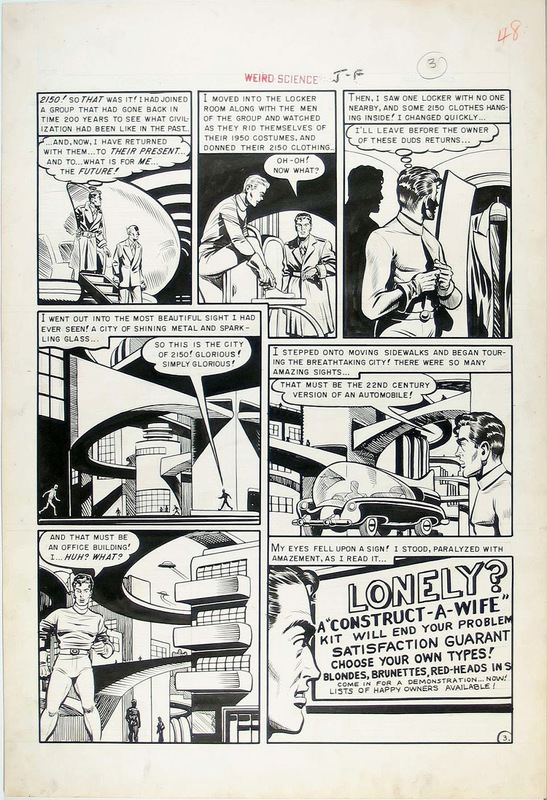 It first appeared in WEIRD SCIENCE # 5 (Jan.-Feb. 1951), published by EC Comics. 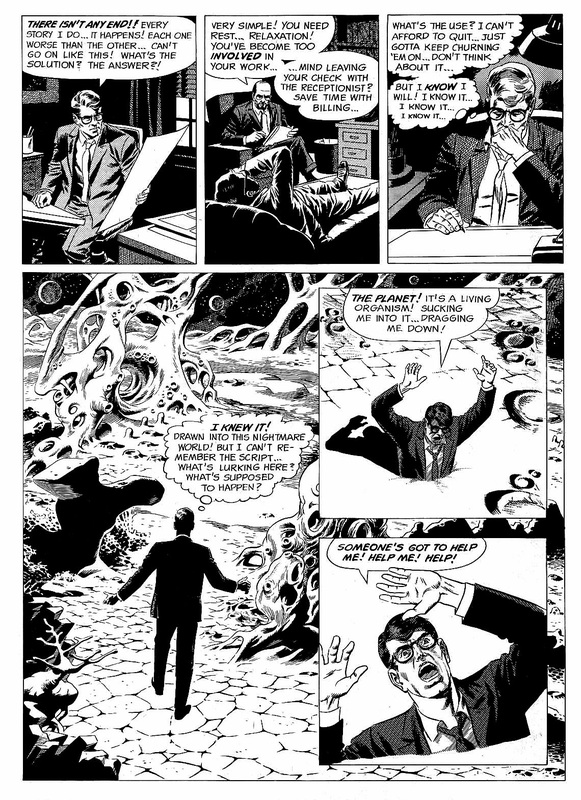 Al Feldstein became involved with comics as a teen, working for Iger & Eisner Studios, initially doing basic assistance like cleaning up pages by erasing pencils, inking balloons, and ruling panel borders. 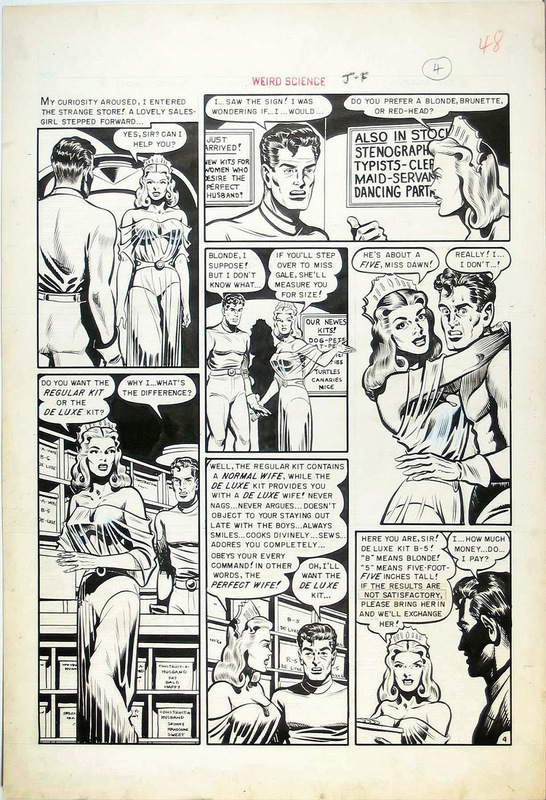 Later he began inking backgrounds, and also inking in leopard spots on the skimpy outfits of SHEENA, QUEEN OF THE JUNGLE. 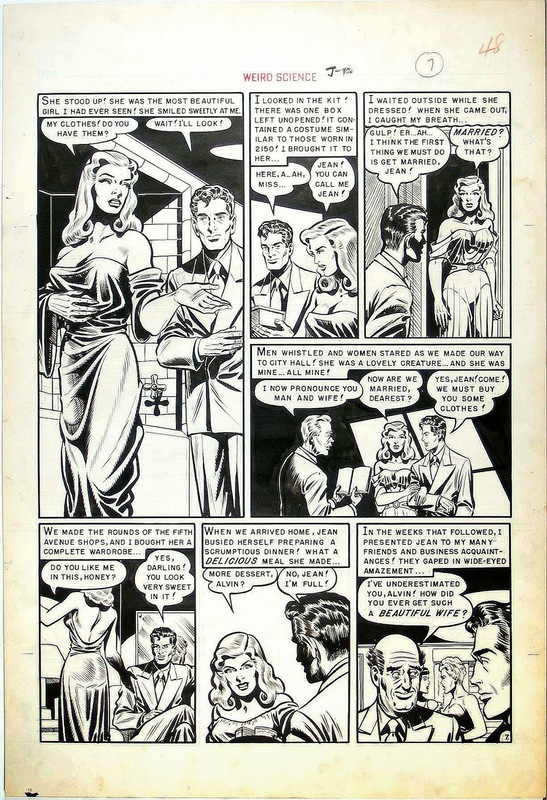 Toward the end of the Forties, after being discharged from the service in 1945, he found work for Fox Comics, where he wrote and drew SUNNY and JUNIOR, which showcased his ability to delineate pretty girls. 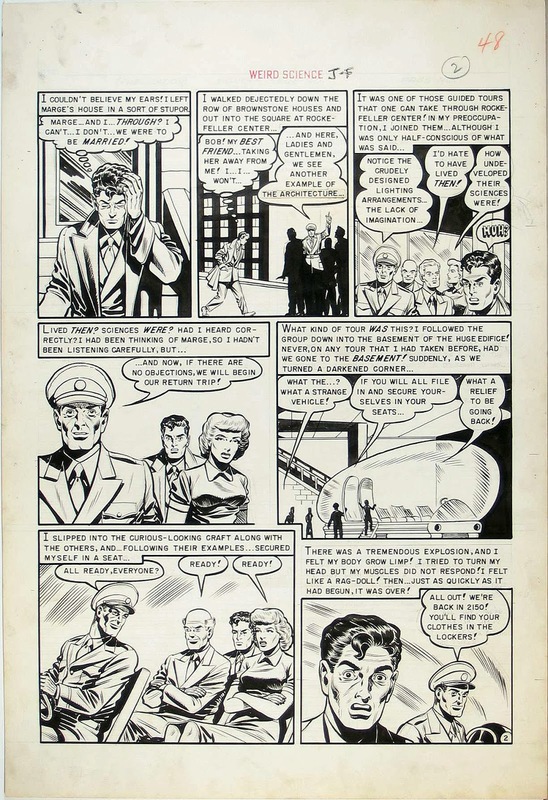 In 1948 Feldstein joined EC Comics where, along with art chores, he became their main writer and editor during the company's highest successes. 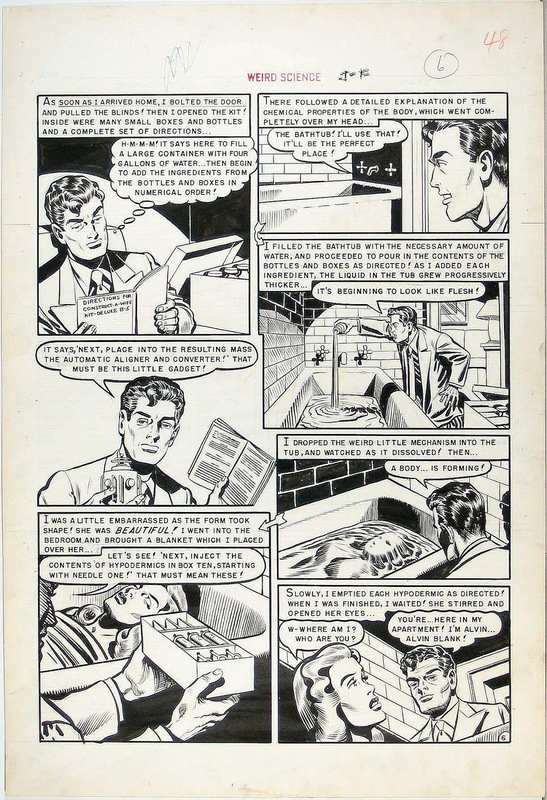 Along with publisher William M.Gaines, Feldstein helped forge the New Trend comics line, with titles like TALES FROM THE CRYPT, VAULT OF HORROR, WEIRD SCIENCE, and others that are widely regarded as benchmarks in 1950's comic book production. 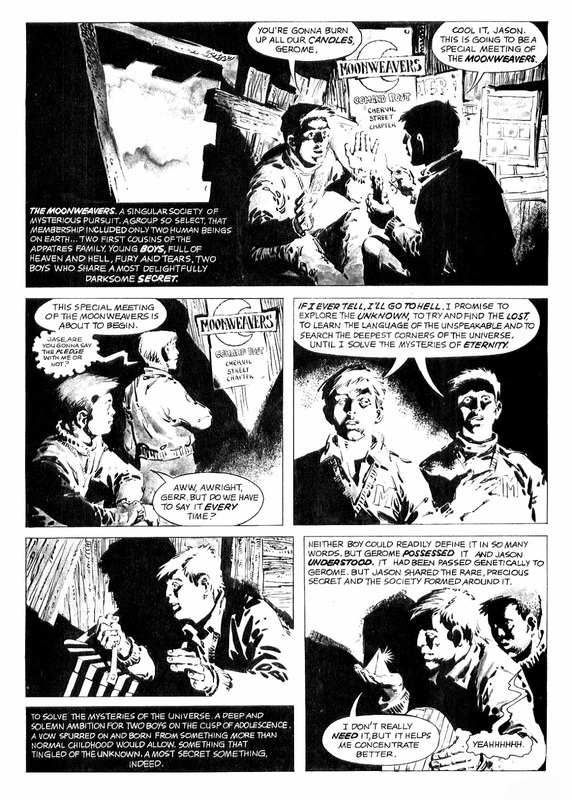 After the United States Senate Subcommittee on Juvenile Delinquency and the Comic Book Hearings in 1954, championed by anti-comic book advocate Dr. Fredric Wertham, artistic freedom in the genre was effectively stifled by the new Comics Code Authority, and among the many industry casualties was EC Comics, whose entire line drew to a close by 1956, save the lone publication of MAD magazine. 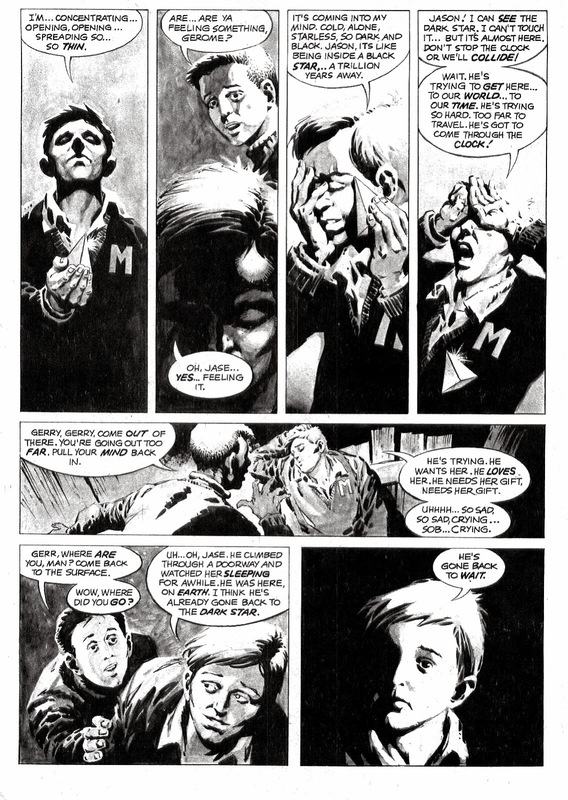 After MAD creator Harvey Kurtzman left EC, Feldstein took the helm of MAD from 1956 until retiring in 1985. Since then he has continued his triumphant artistic life by returning to painting, focusing on Western wildlife. 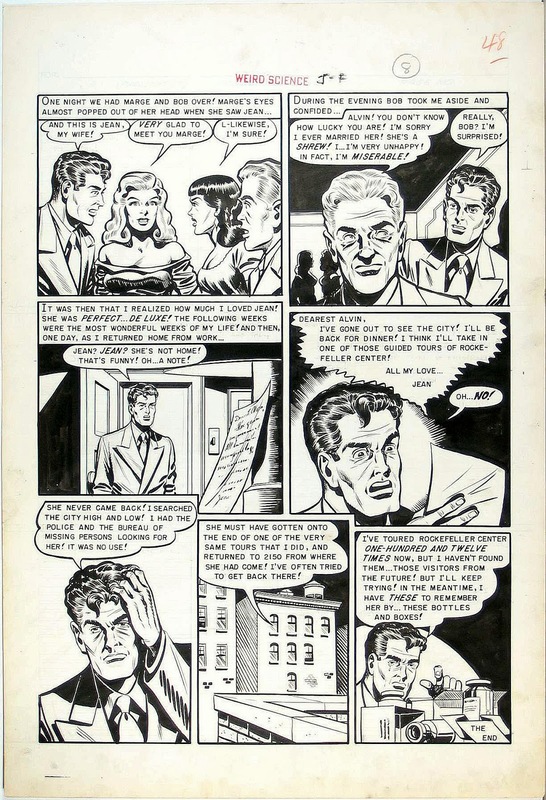 These rare original art boards from EC, with the Leroy machine-lettered panels and pencil marks visible, reveal the competent and confident hand of Al Feldstein in his tell-tale style. 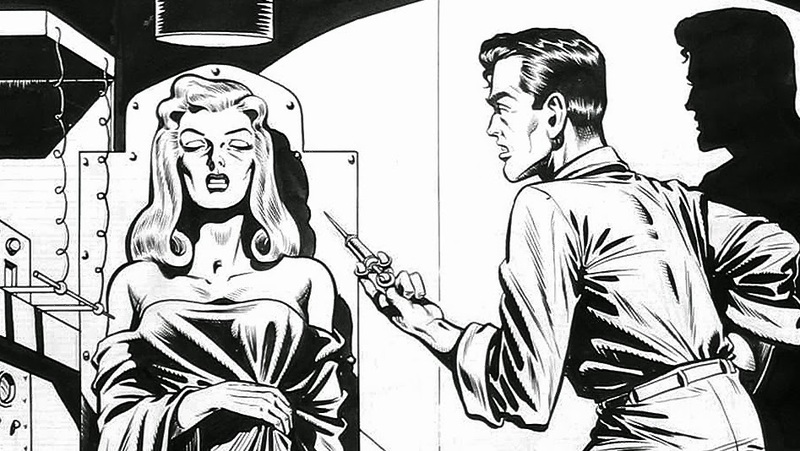 For more Al Feldstein art click here. 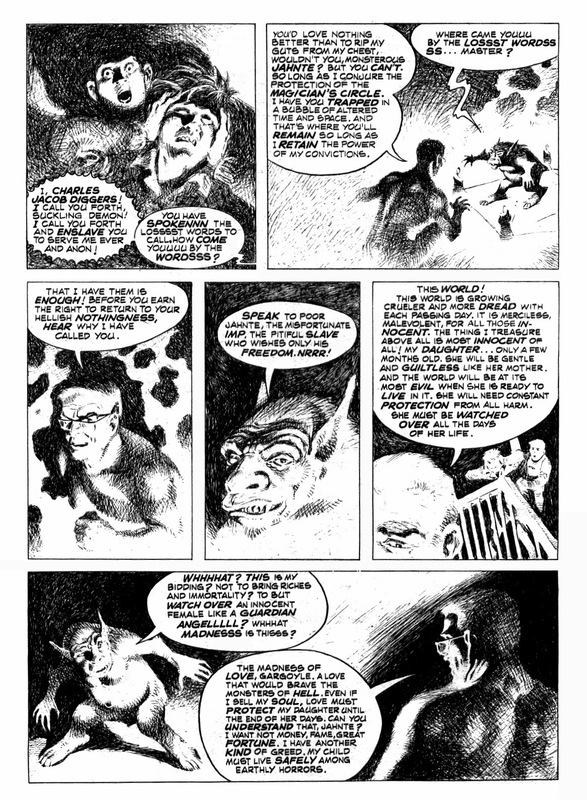 THE MOONWEAVERS comes to us from a series of stories that were published in EERIE in the mid 1970's, written by Budd Lewis and illustrated by Spanish artist Leopold Sanchez. 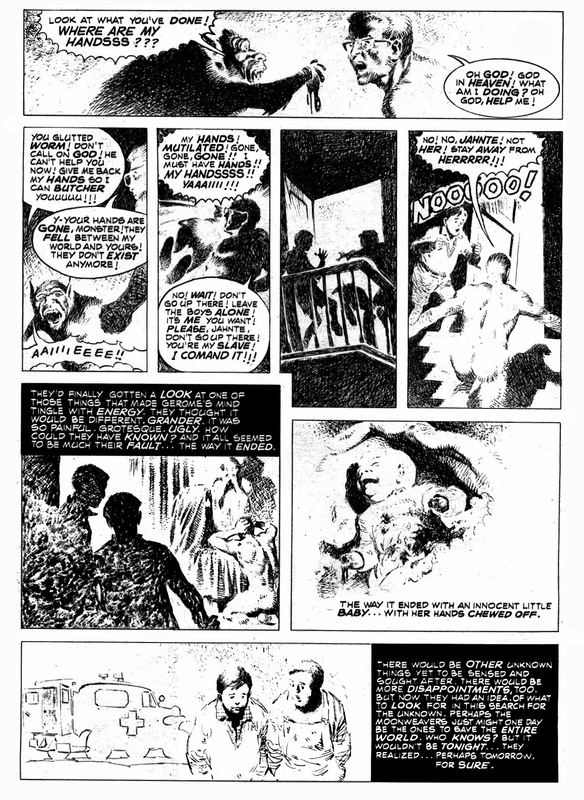 While initially Warren's horror publications, which were obviously patterned after 1950's EC Comics horror model, featured many of EC's well-known artists such as Wally Wood, Joe Orlando, Johnny Craig, Jack Davis, and the like, the line-up eventually changed and soon an influx of Spanish artists(and later Filipino), virtually unknown to U.S. readers, began to reveal themselves. Sanchez was part of the Valencia Studio in Spain with fellow artists Luis Bermejo and Jose Ortiz. 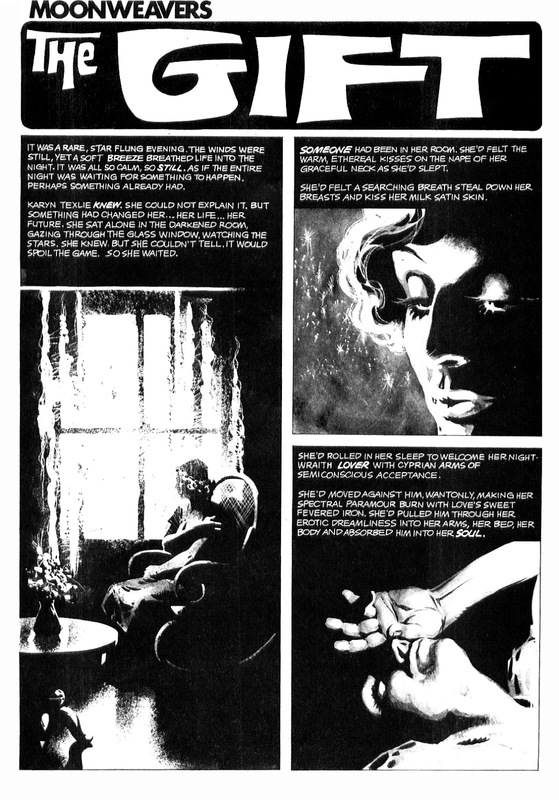 In 1974 all three joined the Selecciones Illustradas agency which began produce work for Warren. 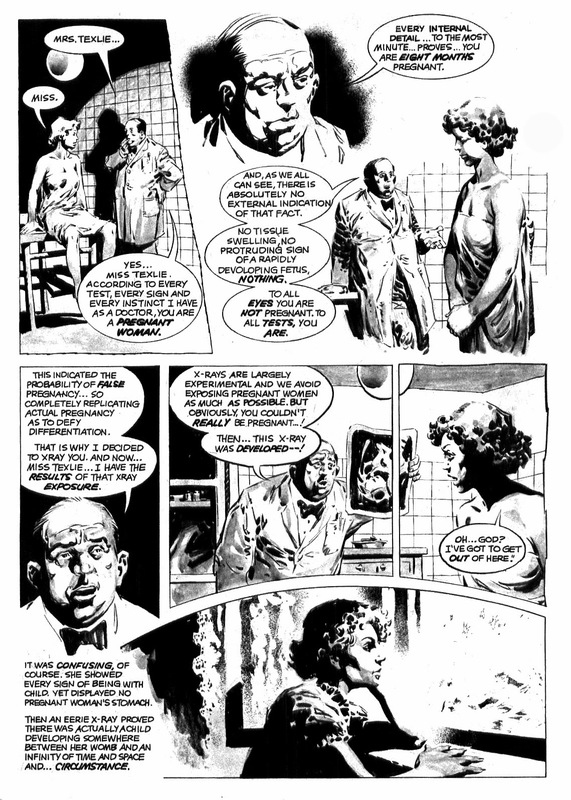 Sanchez' work appeared in Warren's CREEPY, EERIE, and VAMPIRELLA horror stable between 1974 and 1983, often in partnership with Lewis. 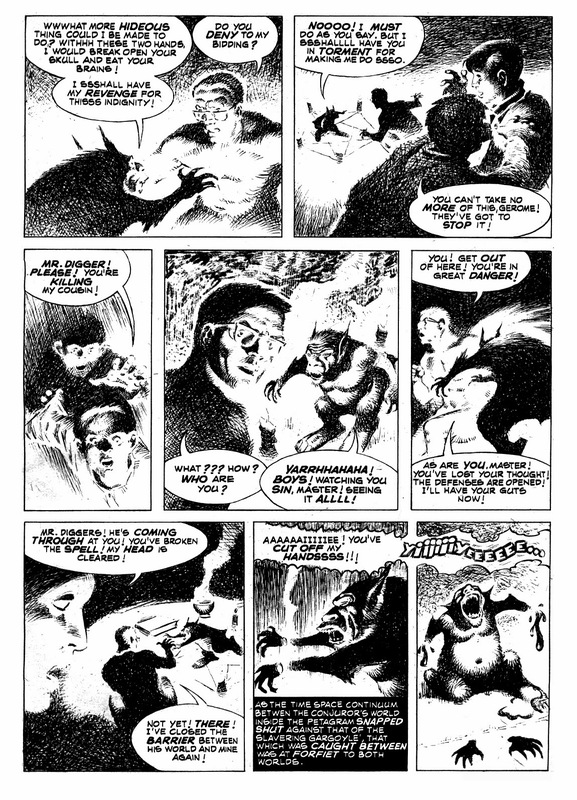 Here they craft two tales that focus on the adventures experienced by two young boys, Gerome and Jason, who have formed a unique club, the Moonweavers, in 1936. Gerome has inherited a supernatural gift from his father, and that ability draws the Moonweavers into dark and mysterious expeditions into the unknown. 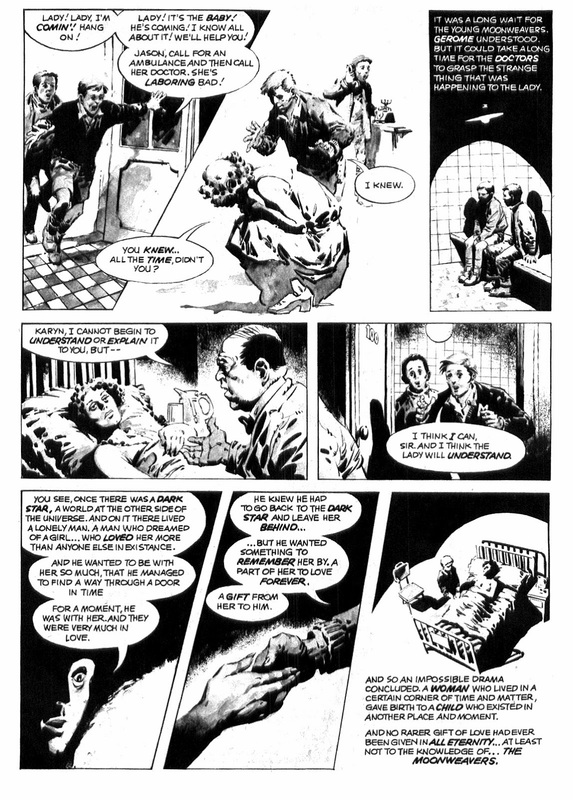 In "DELIVER THE CHILD" and "THE GIFT", Lewis and Sanchez draw us into a world both subtle and horrifying. 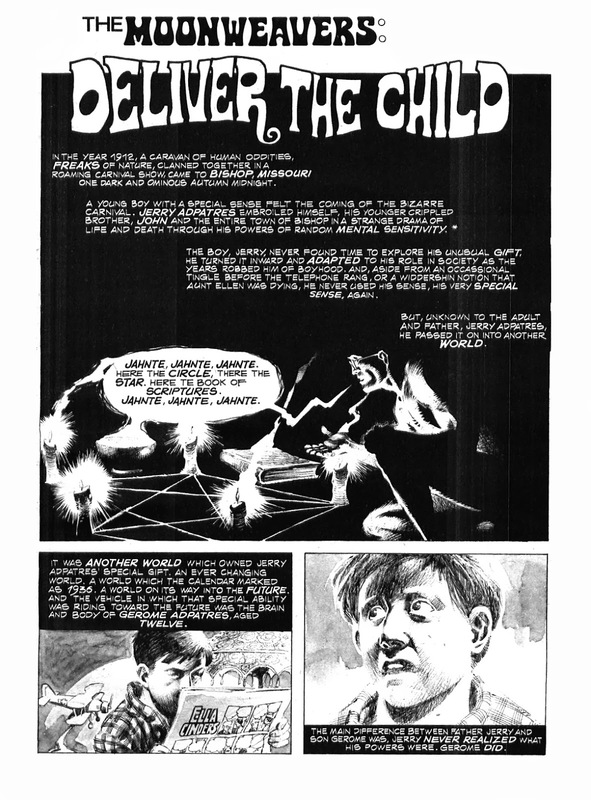 "DELIVER THE CHILD" and "THE GIFT" originally presented in EERIE #76 & 77, 1976. Today's post features not one, but two wonderful artistic talents previously showcased herein. 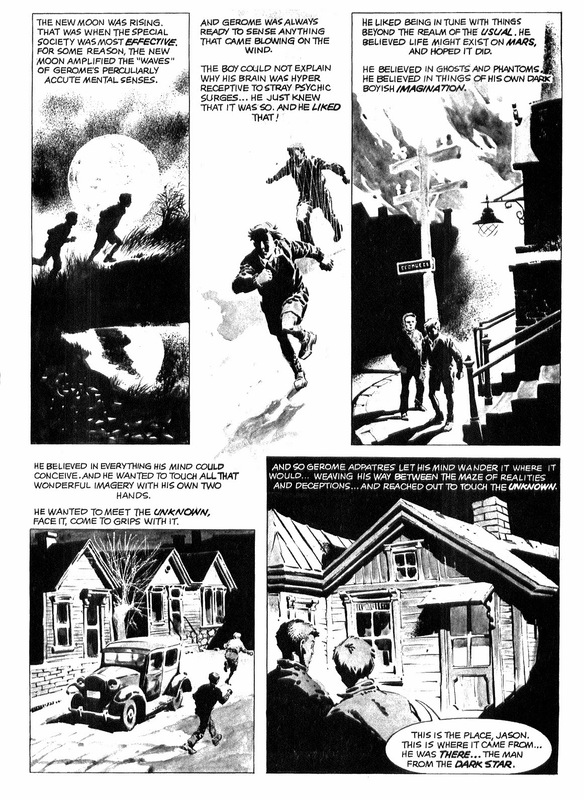 Wally Wood is undoubtedly one of the greatest and most influential comic book artists to put pencil (and ink) to paper, and Dan Adkins is one of the most highly regarded artists to have had the honor to be associated with him. 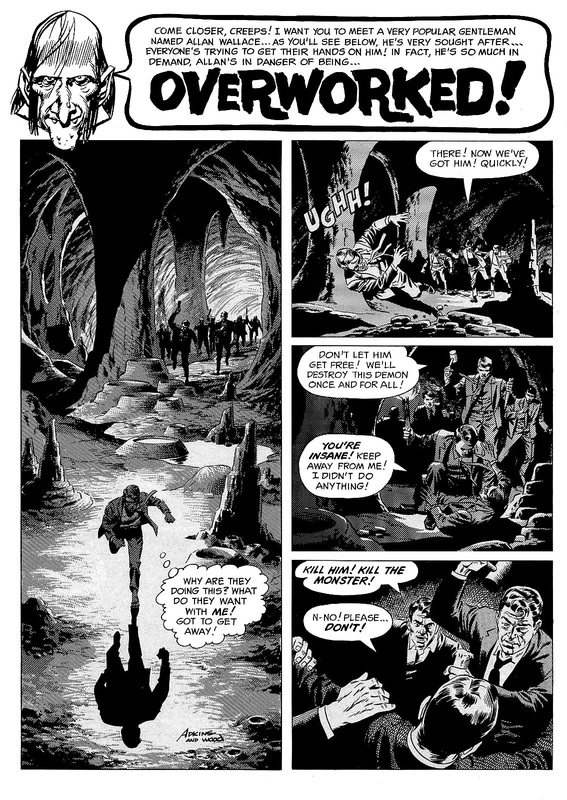 "Wally was 37 and I was 27 when we started working together around 1965...Wally laid out most of the stories, then it was up to the assistants to tighten the pencils - often using swipes from Wally's many files. Then Wally and/or I would ink. Even if I was inking, Wally would ink certain key items like the lead character's face - especially in frontal shots. 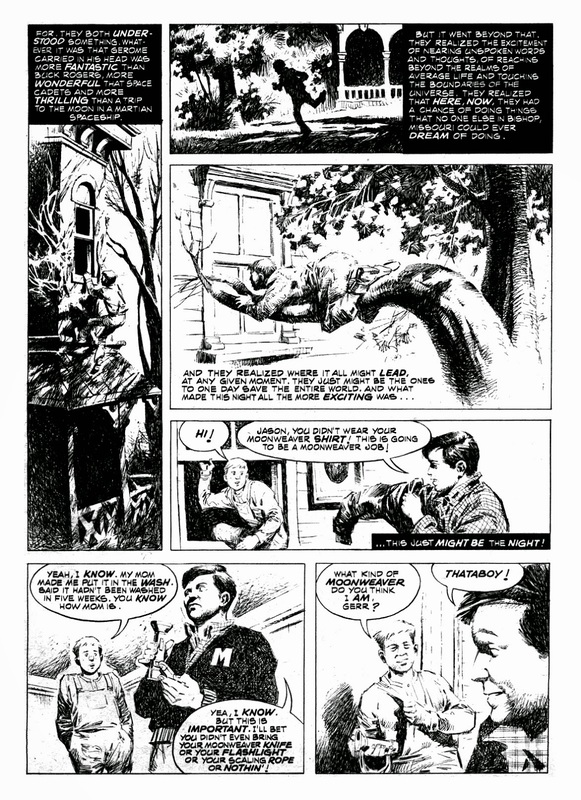 Wally taught me what to leave out and influenced me to update my inking and feathering techniques." 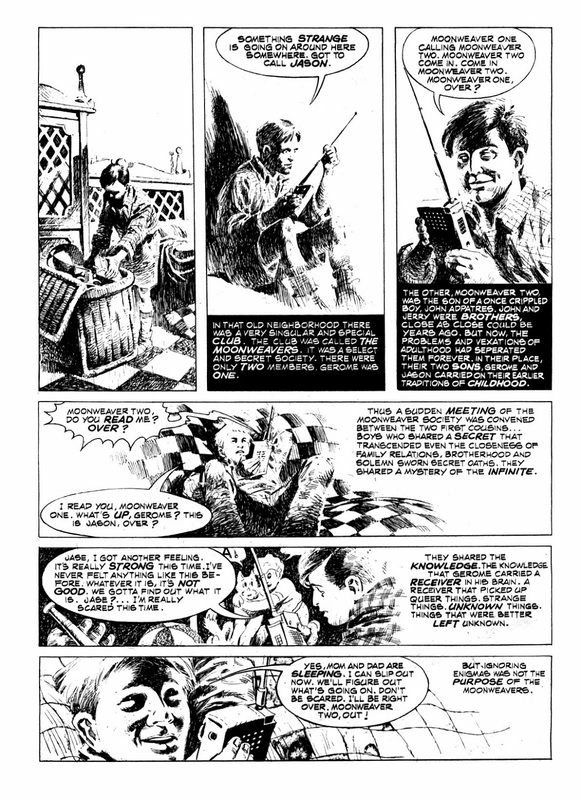 "My favorite collaboration with Wally was "Overworked", which we did for Warren (Publishing). 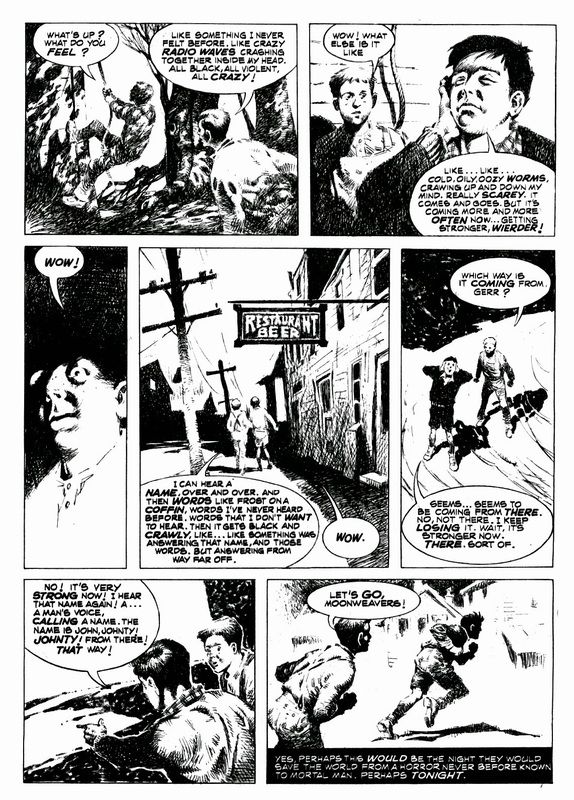 I got credit - for the first time - on that because of Steranko. 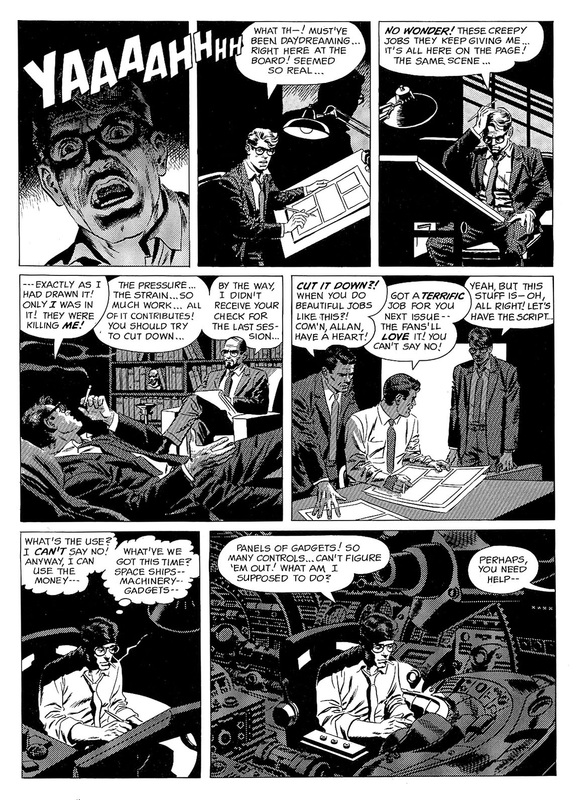 Steranko visited the studio in the company of a sleepy-eyed blonde model. He had an idea for a solo book for Tower and Wally referred him to Samm Schwartz at Tower. 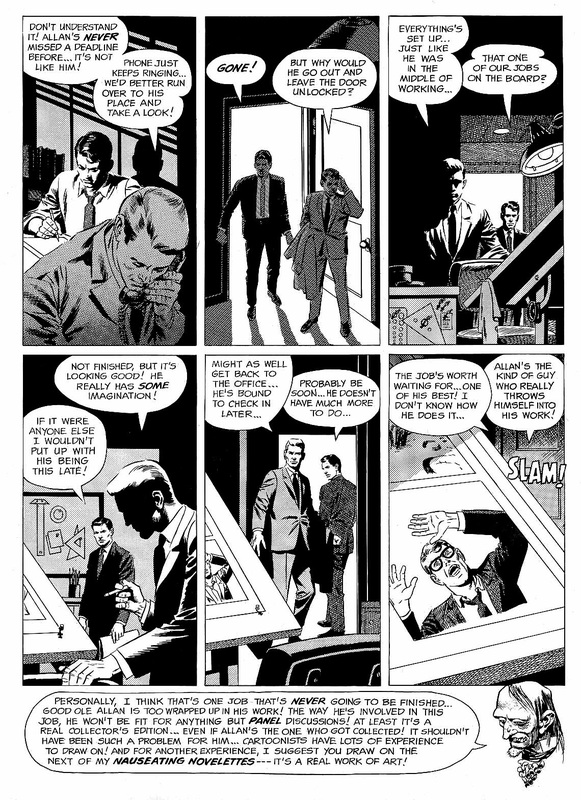 Steranko and Schwartz didn't hit it off but some months later he was working for Marvel with full credit. Wally knew I was jealous so, without telling me, he signed my name on "Overworked" and then surprised me with it." "After about a year and a half, we broke up badly. 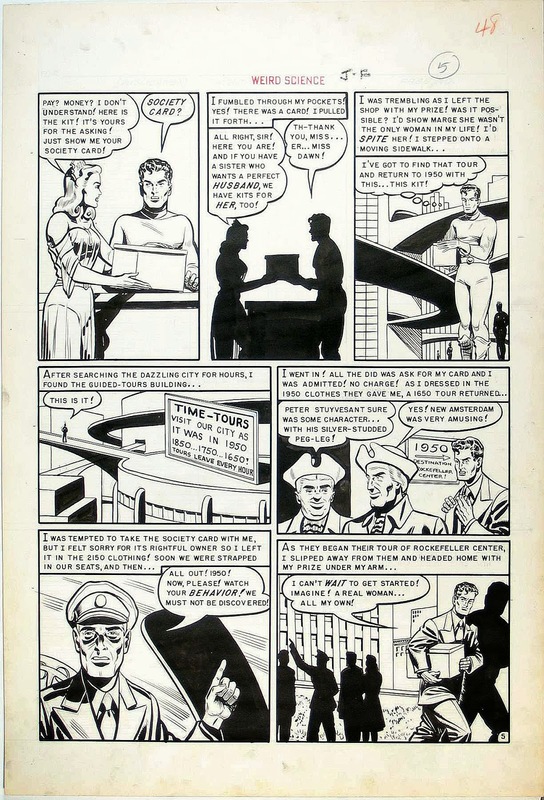 I was already doing work for Warren on my own and went to see Marvel about work, kind of behind Wally's back. They hired me and I called Wally to tell him I was leaving for Marvel. He was upset and said I should have come to tell him face to face. We did make up some years later at a convention around 1972." 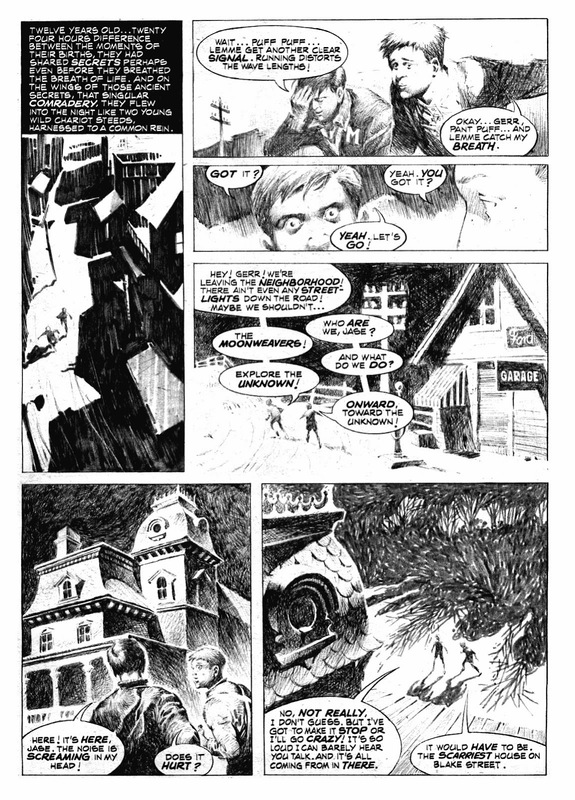 "OVERWORKED" first appeared in print in the June 1966 issue of Warren's CREEPY #9, ostensibly with pencils by Adkins (working from Wood layouts as described above) and inked again by both in conjunction. 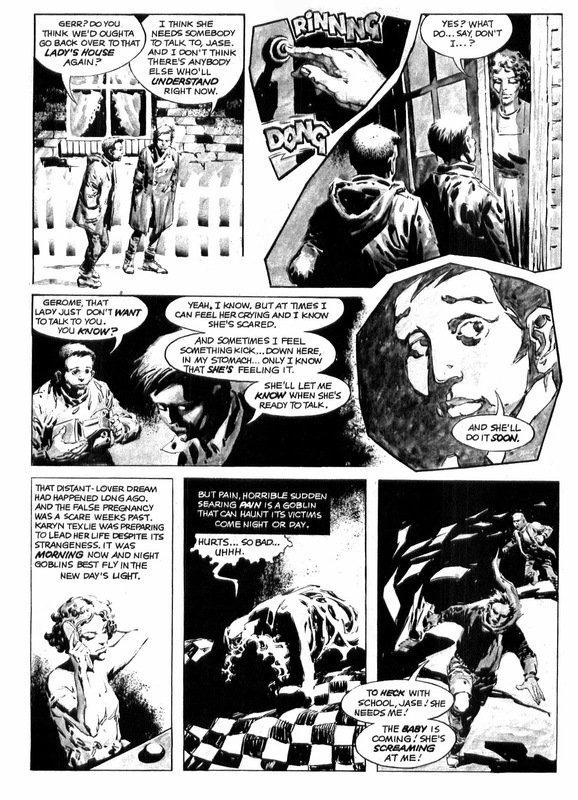 Writing credit was attributed to Archie Goodwin, who was both editor and head writer for CREEPY at the time, though in reprints of the story (notably in Eclipse Comics WORLD OF WOOD #1) it is Wood himself who is credited. 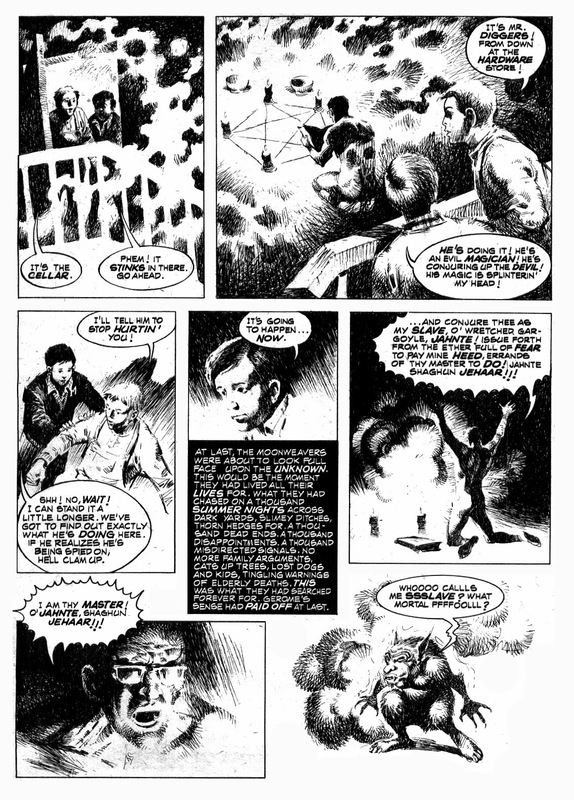 Seeing that it has been documented that Goodwin frequently allowed artists plenty of creative latitude to choose what types of stories they wanted to work on, and with a visionary juggernaut and predominant artiste such as Wood, it is more than likely that the outline, if not the details of the story was in fact Wood's brain child, and Goodwin's contribution therefore possibly relatively minor. 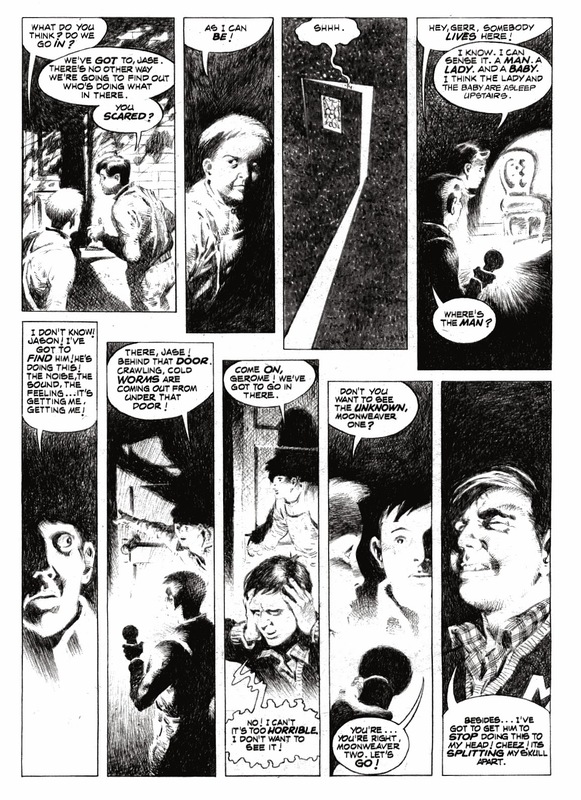 Another clue is the name of the protagonist in the story, comic artist Allan Wallace, a thinly disguised allusion to Wood himself , whose full name is Wallace Allan Wood. 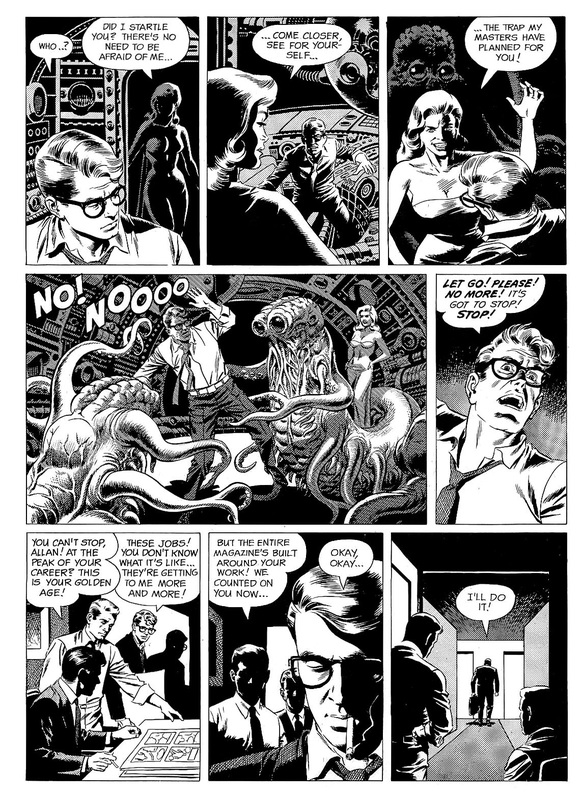 Wallace Wood became famous in the 1950's mainly for his incredible artwork done for EC Comics, in titles like WEIRD SCIENCE and IMPACT, and later in MAD, where his highly detailed panels were filled to overflowing with unmatched power and extreme minutia in his unrivaled style of chiaroscuro. 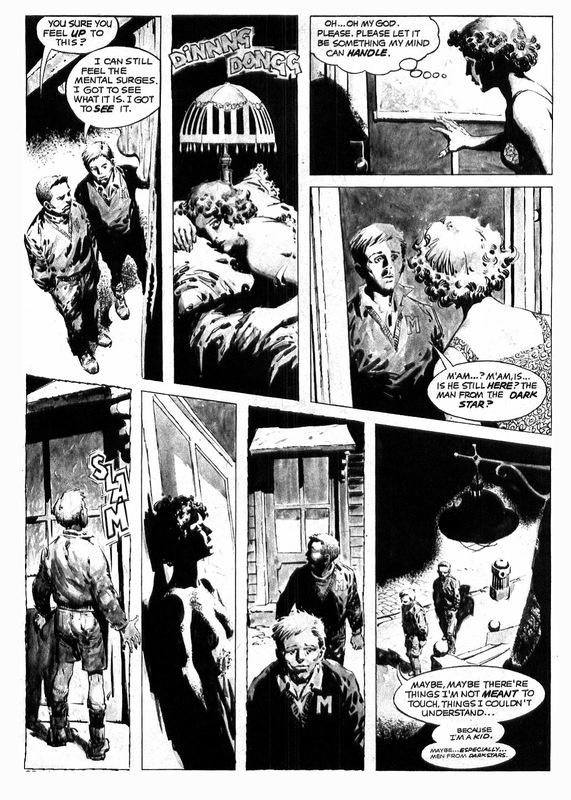 A master of light and shadow on the comic page, as his career progressed he retained the elements of shading he had become known for, while eschewing the more highly complex and intricate detailing that had marked his EC work. Some critics of his later work bemoaned the newer, more simplified streamlined style, and Wood was notably affected and irritated by such criticism. How much pressure he felt can be assumed by the biographical element revealed to us in "OVERWORKED!". 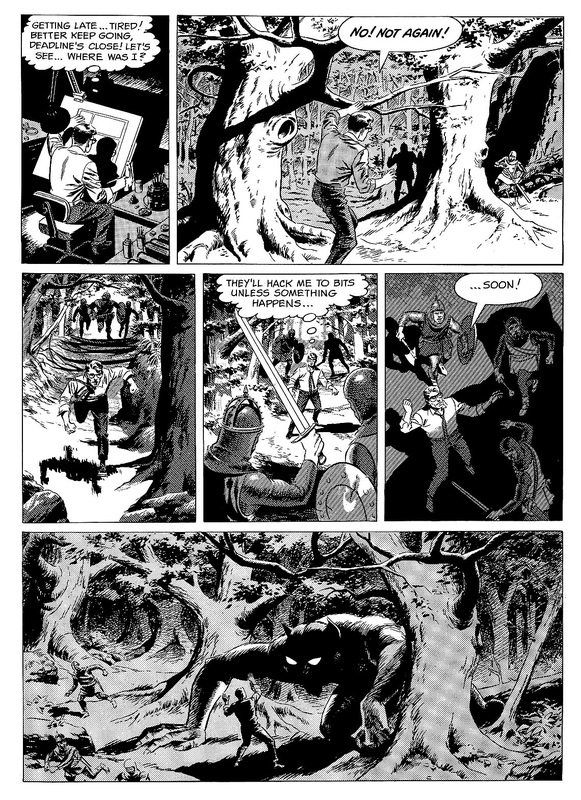 Sadly, tragically, the world lost a pioneer and a genius when Wally Wood, after a decline in his health and his career, committed suicide in 1981. He was only 54 years old. 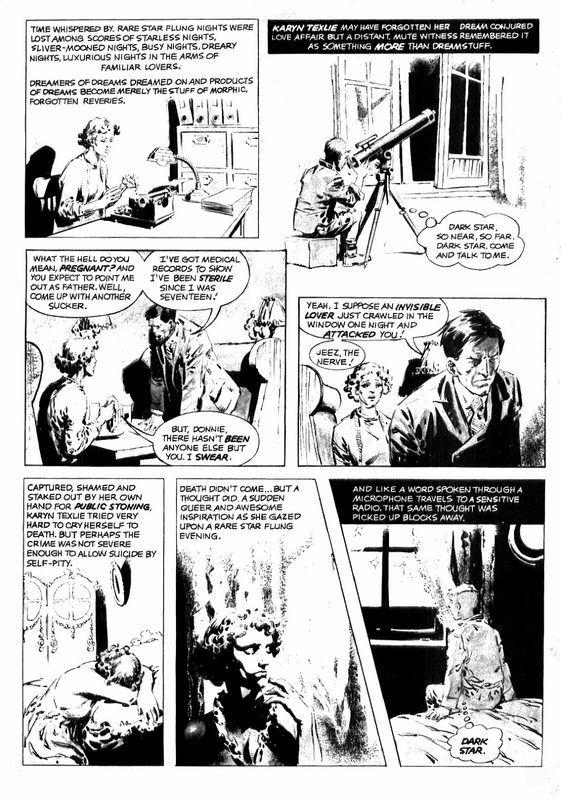 Dan Adkins went on to produce many fine paintings and comic art for Warren, Tower, DC, and Marvel, where he drew for such characters as Sub-Mariner and Doctor Strange, and later became used primarily as an inker, where he utilized the detail and skills he developed under the tutelage of his one time mentor, Wally Wood. Dan Adkins passed away on May 3rd, 2013, at the age of 76.
they both left behind a legacy of inspired works that we can continue to enjoy.